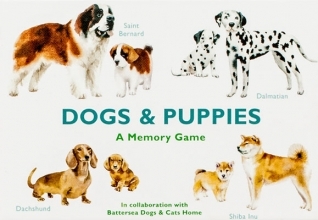 Match the dogs and puppies of 25 breeds from around the world in this beautifully illustrated memory game. To play, simply place the cards face down and see if you can remember where the dog and its puppy are located. Collect more pairs than your opponent to win! With all kinds of breeds included – from Siberian Huskies to Pugs and Dachshunds to Dalmatians – this fun and educational game will appeal to dog lovers everywhere.